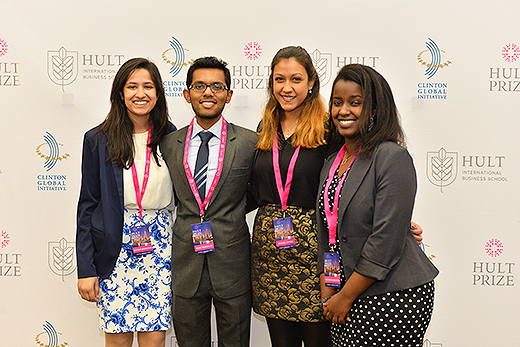 Emory students Safiyah Bharwani, Rifat Mursalin, Rachel Citrin and Victoria Umutoni pose on the red carpet at the Hult Prize competition in Shanghai. The four Emory Scholars who returned last week from China after competing in the regional round of the Hult Prize may not have won, but they did not come back empty-handed. In fact, the Emory College idea for a profitable business to do social good was so similar to the plan by the team that did win, and that of a mentoring nonprofit, that they are already networking. "Our idea was well received," says team member Rifat Mursalin, a Martin Luther King Scholar who graduates in May with a degree in French and economics. "Some of the finalists had already implemented their businesses, so it was not just an idea." Mursalin and his teammates — sophomores Safiyah Bharwani, Rachel Citrin and Victoria Umutoni — met by networking as Emory Scholars and began planning their proposal last fall. Their idea for the $1 million Hult Prize called for creating business incubators in slums, as a way to encourage ideas from local residents to solve local problems. They presented their project at the Hult Prize regional completion in Shanghai, which began March 11, the same day as other regional rounds in Boston, San Francisco, London and Dubai. The Emory team's plan was to start such incubators in Dhaka, Bangladesh. One of the advisers to the Emory team, the Jaago Foundation in Bangladesh, told members it has a similar plan ready for launch in the next few years, Mursalin says. And the team from BRAC University, in Dhaka, won the Hult regional in Shanghai for its existing effort to connect small stores in that city with manufacturers and suppliers. Though the Emory team has not talked partnerships on either idea, the students are definitely staying in touch, Mursalin says. He plans to work at an investment bank in New York after graduation. But as the team settles back into the final weeks of the school year, Mursalin says they hope to figure out ways to have the global impact that they each saw in individual international experiences before the Hult competition. Mursalin, for instance, spent part of his childhood in Dhaka before his family moved to Atlanta when he was 12. Bharwani, a Woodruff Scholar majoring in economics and math/political science, had previously traveled to Mombasa to work as a volunteer with special needs students in Kenya. Also a Martin Luther King Scholar, Citrin had spent a gap year studying Arabic in Oman on a U.S. State Department scholarship before becoming a political science and Middle Eastern and South Asian studies major at Emory. And Umutoni, a Woodruff Scholar majoring in human health and anthropology, learned about public service in her native Rwanda long before she knew it was a value at the college. "Now that we are back, we need to meet as a team to discuss our thoughts and next steps," Mursalin says. The BRAC University team, meanwhile, will advance to the final round of the Hult competition, which will be held in September in New York City.